The summer show st Le Touquet is lovely and only an hour from Calais so it’s a very easy journey. I arrived at 5pm on Tuesday and settled the horses in quickly. I then had to park behind the racecourse grandstand, rather a long way from the stables, as there was no electricity on the show ground. Very pretty, and initially very exclusive, but thank goodness for my bike. After a long day on the Lorry both horses had a quiet ride and a graze and then it was bedtime for everyone. It’s always fun to see who your neighbours for the weekend are. In this case JP and Caroline Daker and Ben Clark and his team. It was also lovely to see Emma and Jo O'Dwyer who I hadn't seen for a while, and to see Chris Franks being so successful on his good team of horses. Wednesday was the trot up, so I exercised Kvint and Emma in the morning, they trotted up well and I cycled into Le Touquet to have supper with Fiona, Andrew and Sophie Robson who were on holiday in Le Touquet. We had a really lovely evening and I cycled quietly back. First to jump on Thursday was Emma who jumped a lovely round in the 1.35 Speed for a minor placing: off to a good start. My lovely friend, Louise Alston and I have helped one another at shows a few times and it seems to be a brilliant system. Also the Robsons very sweetly came to watch so it was great to be off to a good start. 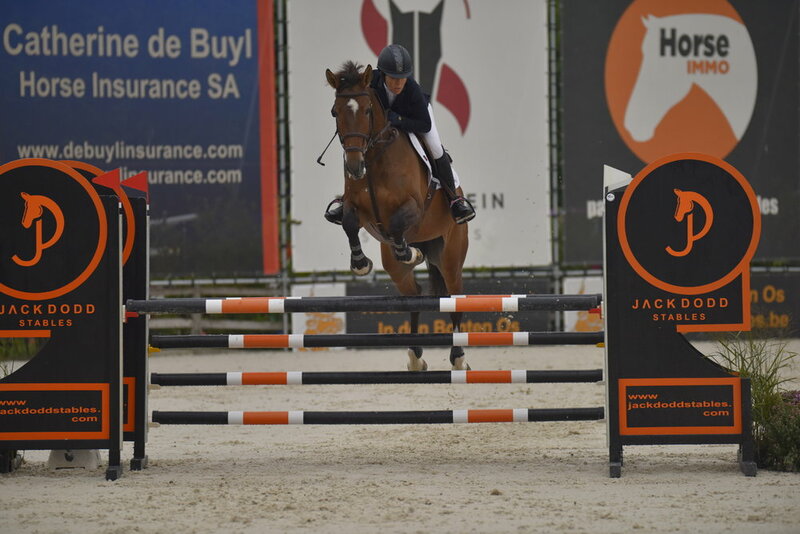 Louise jumped a good round in the Grand Prix Qualifier and Kvint jumped clear in his speed class, just missing out on a place. Le Touquet has a brilliant, and very reasonable champagne bar so we had a lovely drink in the evening sun. On Friday Kvint jumped another good round for a minor placing and I was first to go on Emma in the 1.40 Grand Prix Qualifier. Unusually she just didn’t make the distance to the 4th fence quite well enough and had the back bar in an otherwise lovely round. Louise and Doublet jumped a fabulous double clear for a good placing in very competitive class. Louise and I then wandered in to town for a delicious fishy dinner. I just had Kvint to Jump early on Friday. 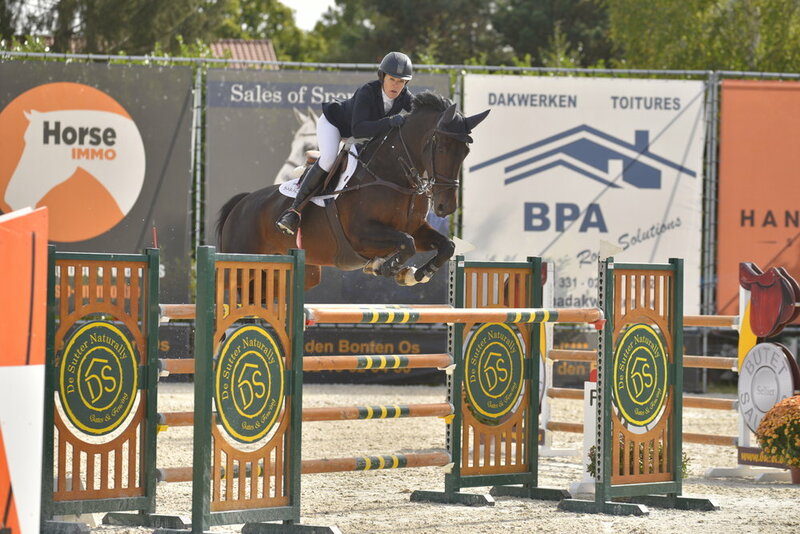 He did a splendid round and really went quite quickly for a big, inexperienced horse. However, I was completely caught by surprise when he was 8th, necessitating a trip into the prize giving on Emma wearing the collecting ring steward’s suit jacket. I would have looked much neater without it, but rules are rules - even when it’s 32 degrees. Emma was thrilled- she loves a good prize giving! With a plaque, a rosette and clinging onto the huge jacket with only a snaffle in Emma we did a very nervous lap of honour. We then watched Lisa Cubitt win a very exciting Derby and then I decided I’d had more than enough sun and had a very quiet evening. I just had Emma to jump in the small Grand Prix this morning- which was absolutely enormous! She warmed up well, but perhaps not as flashily as normal and although we had great shots and she made the distances really well she had three fences down so I called it a day. She’s a lovely horse and we’ll save her for another day. She seems fine, but it was very, very hot all show. Having been home for two days, everything is washed and tidied away, and I had a busy day at work yesterday. My sister Polly, her husband, Vincent, their four children and two ponies arrived this afternoon for the week. The ponies have settled into the vegetable garden, the only available space, and a good afternoon of swimming has been had. We're all ready for a mass ride tomorrow! The horses have had a good check over from Caitlin McCaffery, our fantastic chiropractor, today, and are in good order, and Emma has had a blood test to make sure she hasn't any problems that we aren't aware of. Both Heidi and Askeaton seem to have benefited from a break after Hickstead and have come back to work very well. They will go to a show at Felbridge at the weekend and Kvint and Emma will go to the National Championships at Stoneleigh on Sunday for the 1.30 Championship.